Thanks to everyone who connects with me on all social sites, I sincerely appreciate it! Last week I passed 300,000 followers on Twitter, and to my knowledge I remain the only chess grandmaster (male or female) to be “verified” on Twitter. 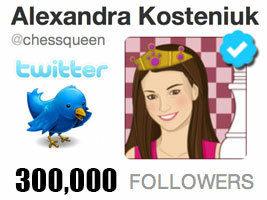 I’ll be glad if you connect with me on Twitter (accounts “chessqueen“, “chessking“, “chessblog“, Facebook (“chessqueen“, “chessking“, “chessblog“), YouTube (chessqueen, chessking, chesskillertips, “chessqueentv“), Instagram (“chessqueen“), LinkedIn (Alexandra Kosteniuk). I’d love to connect with all of you on all my social sites, or by email. If you have not yet signed up for my free email newsletter, please sign up now!